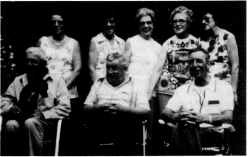 Doris married Walter Carlson and resides in Kenora. They have one daughter, Starla, living in Minaki, and one son, Wayne, living in Ear Falls. title on April 21, 1904. .
John was a trustee at the Scandinavia school from 1908 to 1909. 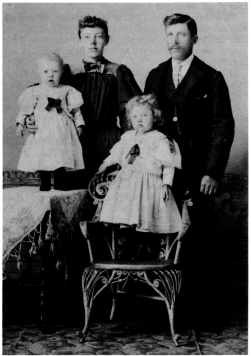 John and Matilda had two children, twins Herman Algot born on April 18, 1897 and Eline Natalie born on April 18, 1897. It is believed that they were baptized on July 16, 1897 at the James Hemmingson home following the Norse wedding by Canon Wharton Gill. (refer to Norse wedding). Olaf Fred Svenson was born May 9, 1865, in Wisconsin. Minnie Randeana Svenson was born May 27, 1877 in Polk County, Wisconsin. Minnie's maiden name was also Svenson. Olaf and Minnie were married in the United States. They and six children; Alma, Tillie, Miles, Ogden, Gladys and Myrtle came from Middle River, Minnesota, to Canada, arriving in Minnedosa April 27, 1906. Alma, Tillie and Miles herded the cattle while their Father, Mother, Ogden, Gladys and Myrtle rode in the wagon along with all their belongings. They farmed in the Bethany area for a number of years. The older children attended Little Bethany, and later Clanwilliam school. The family were members of the Immanual Lutheran church, Clanwilliam. The children were confirmed there. Tragedy struck in 1922, their home burned. Until a new home was built, they lived in the Immanual Lutheran church Manse. The family moved to the Thomas Turner farm S.W. 21-16-18W. By this time, they had seven more children; Effie, Ella, Ralph, Ruth, Eleanor, Arden and Ray. Their youngest children attended Crocus Hill School. Olaf and Minnie purchased the Palace Garage at Strathclair. In 1934, they built a cottage at Clear Lake, then in 1940, moved to Onanole. Olaf passed away in 1942. Ray, the youngest son purchased the George Barclay farm where Minnie lived until she passed away May 11,1968. Olaf Svenson Family - 1898. Left to Right: Tillie, Minnie, Alma and Olaj. Olaf Svenson Family. Back Row, Left to Right: Effie, Myrtle, Alma, Ella, Eleanor. Seated: Miles, Ogden and Ray. You'd worry less what people think of you if you knew how seldom they do.